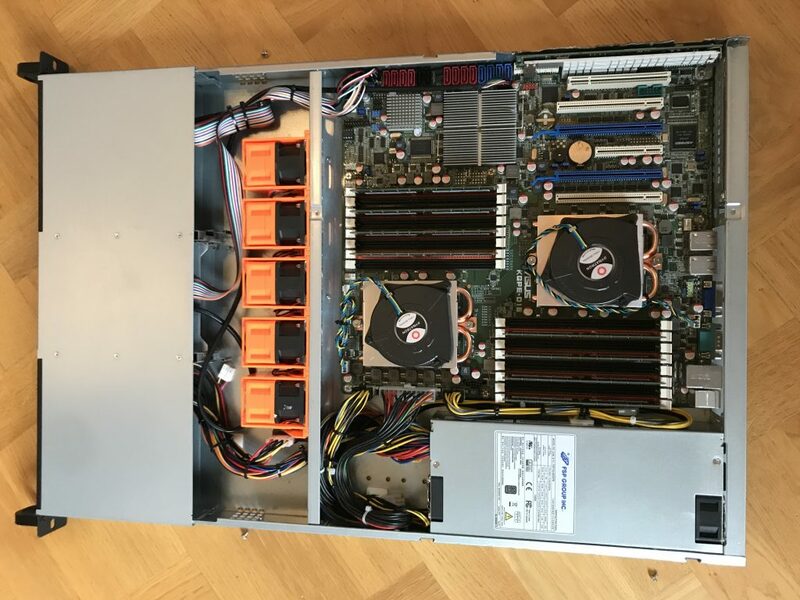 I have bought a 1U server to use as a virtualization platform to host my personal online services (mail, web, DNS, nextCloud, Icinga, Munin etc). This is the first time I have used a high-end libre hardware device that has been certified with the Respects Your Freedom certification, by the Free Software Foundation. To inspire others to buy a similar machine, I have written about my experience with the machine. The machine I bought has a ASUS KGPE D16 mainboard with modified (liberated) BIOS. I bought it from Vikings.net. Ordering the server was uneventful. I ordered it with two AMD 6278 processors (the Wikipedia AMD Opteron page contains useful CPU information), 128GB of ECC RAM, and a PIKE 2008/IMR RAID controller to improve SATA speed (to be verified). I intend to use it with two 1TB Samsung 850 SSDs and two 5TB Seagate ST5000, configured in RAID1 mode. I was worried that the SATA controller(s) would not be able handle >2TB devices, which is something I have had bad experiences with older Dell RAID controllers before. The manufacturer wasn’t able to confirm that they would work, but I took the risk and went ahead with the order anyway. One of the order configuration choices was which BIOS to use. I chose their recommended “Petitboot & Coreboot (de-blobbed)” option. The other choices were “Coreboot (de-blobbed)” and “Libreboot”. I am still learning about the BIOS alternatives, and my goal is to compare the various alternatives and eventually compile my own preferred choice. The choice of BIOS still leaves me with a desire to understand more. Petitboot appears more advanced, and has an embedded real Linux kernel and small rescue system on it (hence it requires a larger 16MB BIOS chip). Coreboot is a well known project, but it appears it does not have a strict FOSS policy so there is non-free code in it. Libreboot is a de-blobbed coreboot, and appears to fit the bill for me, but it does not appear to have a large community around it and might not be as updated as coreboot. The PIKE2008 controll card did not fit with the 1U case that Vikings.net had found for me, so someone on their side must have had a nice day of hardware hacking. The cooler for one chip had a dent in it, which could imply damage to the chip or mainboard. 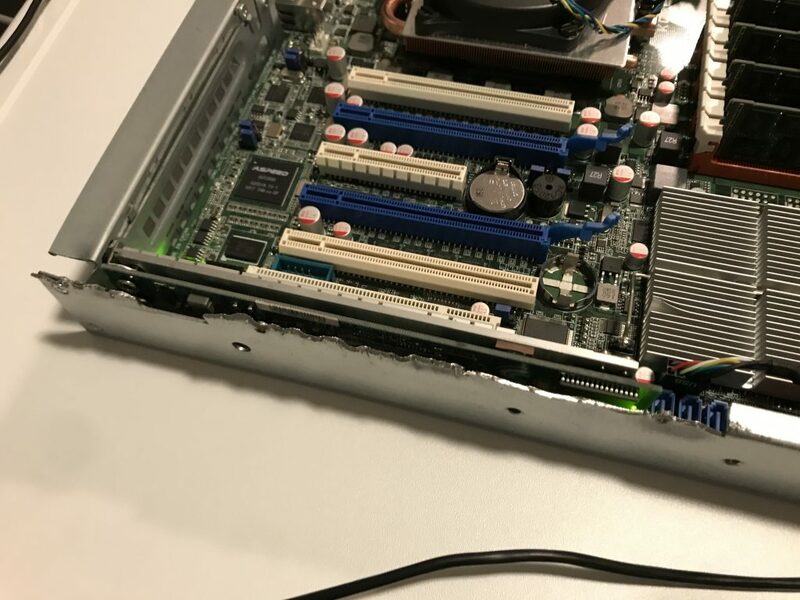 The chip is close to the RAID controller where they modified the 1U case, so I was worried that some physical force had been applied there. The graphical installation of Debian 9.x stretch does not start. There is a X11 stack backtrace on booting the ISO netinst image, and I don’t know how to turn the installer into text mode from within the Petitboot boot menu. Petitboot does not appear to detect a bootable system inside a RAID partition, which I have reported. I am now using a raw ext4 /boot partition on one of the SSDs to boot. Debian 8.x jessie installs fine, since it uses text-mode. See my jessie installation report. The graphical part of GRUB in debian 8.x makes graphics not work anymore, so I can’t see the GRUB screen or interact with the booted Debian installation. Reboot time is around 2 minutes and 20 seconds between rsyslogd shuts down and until it starts again. On every other boot (it is fairly stable at 50%) I get the following kernel log message every other second. The 00:14.0 device is the SBx00 SMBus Controller according to lspci, but what this means is a mystery to me. That’s it for now! My goal is to get Debian 9.x stretch installed on the machine and perform some heavy duty load testing of the machine before putting it into production. Expect an update if I discover something interesting! This entry was posted in debian, hardware and tagged amd, d16, debian, fsf, opteron, ryf, vikings by simon. Bookmark the permalink. Have you tried using another graphic card during the install? No, I haven’t tried another graphics card. If I can’t get graphics to work fully with another BIOS, I will try a separate graphics card, but it feels like a step in the wrong direction.